New year’s resolution – to learn Morse code? Now is the time to start. Morse classes started again at Danbury Village Hall at 7pm on Thursday the 17th of January 2019. If you are a complete beginner Danbury is the best place, you will have your own “Elmer” to instruct and guide you. If you just want to refresh your Morse skills Danbury has a group of enthusiasts who will be pleased to help. If you just want a pleasurable evening with CW friends come along and join us for a fun evening whenever it suits you. Contact : Andy G0IBN, g0ibn1@yahoo.com or just drop in. Can you hear the picture? The November talk was by founder member, Nick G4HCK, on his experience of MMSSTV, i.e sending pictures via SSB, FM and repeaters. “I’ve no idea what all the buttons do, but it works!”, encouraged those who might have been overwhelmed by all the settings. 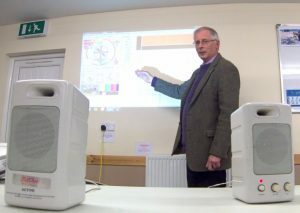 This is the value of club meetings, Nick showed how easy it is to send and receive pictures (visual medium) over the radio (audio medium) using free MMSSTV software and he instantly answered questions that might have taken ages to look up in the manual. Conveying a sense of enthusiasm is the key to any good talk – as demonstrated by Acorns Member Gary M6GPM, who gave a presentation and demonstration of DMR at the October club meeting. 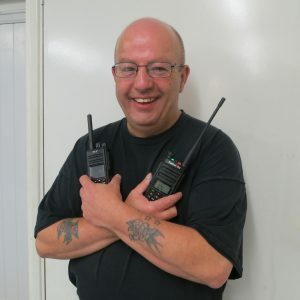 He brought two hand-helds and a hot spot connected to his mobile phone from which we were able to listen in to a conversation with a station from America in Grays, Essex. The hands-on demo was followed by a short YouTube video that covered the more technical aspects of Talk-Groups, Time Slots and Code Plugs. A useful encouragement into this aspect of the hobby.